Grand Champion All-Age Female was DH Goosebumps, owned by Searle Ranch of Monument, Colo. While there’s a growing market for “Longhorn Lean Beef,” there’s still a lot of interest in the unique genetic traits and appearance of this oldest of American cattle breeds. Attesting to that fact was the interest shown in the Mountain States Texas Longhorn Association’s 16th Annual Registered Texas Longhorn competition held last month at Latigo arena in Black Forest, Colo. The Grand Champion steer, Silverado Shadow, was a 6-year-old sporting horns that span well over 7-feet tip-to-tip! His pretty speckled hide and gentle disposition typify the “personality” that attracts a lot of part time ranchers to the historic breed. However, reproduction and adaptability remain the mainstay of the breed and the sale of breeding stock is the focus of most owners. Cows and bulls are judged for their reproductive functionality, and a fat calf at side weighs strongly with the judges. The top cow, selected as Grand Champion All-Age Female was a 9-year-old owned by Searle Ranch of Monument and Ellicott. The same ranch, which is managed by Gary Lake, exhibited the top steer. Reserve Champion All-Age Female was Shadow Dancer, a 4-year-old owned and shown by Randy and Marsha Witte of Peyton. Grand Champion Bull honors went to Batman, bred and shown by the Wittes. Reserve Champion Bull, CB Zapata el Grande, was shown by John and Darlene Nelson of Cloverbloom Ranch in Wellington, Colo. Stan Jernigan of Cross Plains, Texas judged the Open Show, while Paige Evans of Kiowa, Colo., judged both heifer futurity classes and the Trailblazer (New Breeders) Division. Winners of the futurity were Stan and Lorna Searle in the yearling class and Clyde and Virginia Peek took First place in the 2-year-old class. Peeks also took top honors in the Trail Blazer Division. Texas Longhorn Association, has members in Wyoming, Nebraska, Utah, Colorado and Arizona. 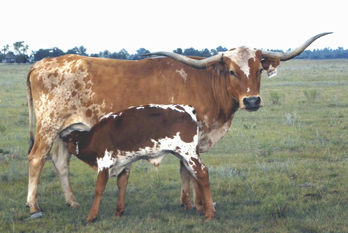 For information on the Texas Longhorn breed or either association, please contact Darlene Nelson by email at clovrblm@ezlink.com.